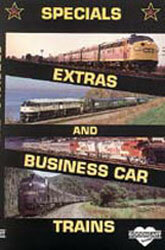 Many of today's railroads still operate colorful business car trains. They are used for executive travel, to entertain customers, inspect the railroad, on Operation Lifesaver trains and many other special uses. For much of the past decade, Goodheart cameras have been in the right place at the right time to catch this parade of special trains. Now you can see them any time you wish, just by hitting the "PLAY" button. Check out Santa Fe "Warbonnet" FP45's pulling a special train to the Grand Canyon. Then watch the CSX F units in Appalachia plus brand-new General Electric "Dash-8's" on the Clinchfield Railroad's Santa Claus train. Take a look at Conrail's Pullman Green business car train touring the east behind a matched set of E units. Marvel at the restored Burlington Northern F units on the point of a special train in the new "Presidential" livery. Plus you'll see Metra's blue E units in Chicago and Nickel Plate Road steam locomotive 765 on a special company train plus much more!